Creative power couple Leah Lawrence, the designer and proprietress behind swimwear and mercantile Drifting Arrows (driftingarrows.com), and Billy Bartels, the designer of jewelry line Vim Beget (vimbeget.com) launched Baleen, a new jewelry collaboration last April. The two fabricate everything in their Ballard studio, mostly out of brass (to keep prices low, Lawrence says) with the addition of gemstones, tassels and wooden beads. 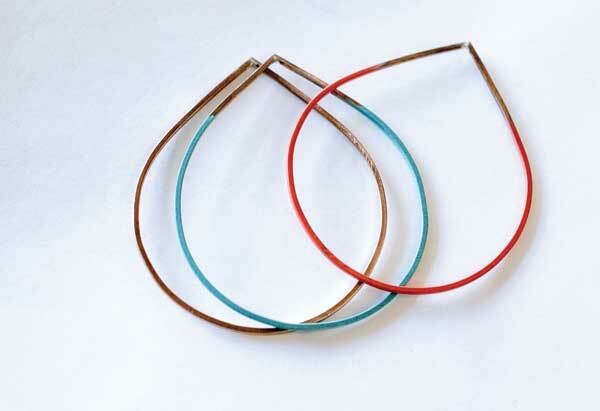 Prices are insanely (and deliberately) reasonable, ranging from $24 for earrings to $38 for necklaces, but it’s the pair’s Raindrop bangles (set of three for $36) that captured our hearts for their unusual teardrop shape and colorful powder-coated finish. Available at Cairo, Capitol Hill, 507 E Mercer St., cairocollection.blogspot.com; and online at shopbaleen.com.